The phone co-designed by LG and Google - LG Nexus 5X is a mid-range device aiming to capture a larger share of the market in the smartphone battle. The phone feels more of a Google device than a LG phone. There are some good tweaks to the device and it comes with special added features. You can make use of ebay coupons from CashKaro.com to get the device for a discounted price with the benefit of added cashback. Here is the comprehensive review of the smart device that is thought to break stereotypes and set a new trend. The phone, though it has a powerful inside, is sleek on the outside. It has a thickness of 7.9mm and fits easily in hand to be carried along. Weighing at 136 grams, you will not feel the phone in your pocket. The volume rocker key and lock key are on the right side while the left side is devoid of any keys. The bottom part has the 3.5mm headphone jack and a USB Type-C port. The display is optimum for a phone of this stature - 5.2 incheswith a resolution of 1080p. The screen is protected by Corning Gorilla Glass 3 which prevents scratches and cracks in case the phone slips from hands. LG Nexus 5X is available in three colors - Carbon, Quartz and Ice. Sporting a 5.2-inch display, the phone has a screen with a pixel density of 423ppi. The display supports multi-touch as well. The device is powered by a hexa-core (a Quad-core 1.44 GHz Cortex-A53 & a dual-core 1.82 GHz Cortex-A57) processor. There is 2GB of RAM for the multitasking needs of the device and an Adreno 418 GPU for graphic needs. There are two variants available - one with 16GB and another with 32GB internal storage. There are however no external storage options available. Two cameras - one on the front and one at back - are present. The rear camera has a resolution of 12.3MP with added features like dual-LED flash and laser autofocus. The front camera has a resolution of 5MP. The battery capacity of the device is 2700mAh. The phone which runs on Android v.6.0 Marshmallow has the latest updated software which has more added features when compared to the Lollipop version.The hexa-core processor can take care of all demanding tasks with ease, while the 2GB in-built RAM makes sure that the phone does not lag. The GPU takes care of the intense graphic needs when playing games and opening graphic-intense applications. The rear 12.3MP camera clicks very good images even under low-light conditions. The front 5MP camera is ideal for Skype calling and selfie shots. The battery lasts for one whole day, under moderate to heavy usage. 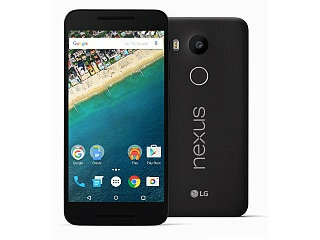 The LG Nexus 5X has a plethora of connectivity option available – USB Type-C connectivity, NFC (Near Field Communication), Wi-Fi, Bluetooth v.4.2 and GPS with A-GPS. The sensors include a fingerprint sensor at the back of the phone, gyro sensor, proximity sensor, barometer and accelerometer. There is also an Android Pay facility which enhances mobile payments. The phone is a worthy pick at its price of Rs 25,000. It has the best software combined with a killer hardware, making it a powerful package. It competes with the Samsung Galaxy Note 3 which is at a similar price range (available with discounts using flipkart coupons. Buy the phone for its durability and ability to update to the latest software - as and when available.